each registration package receives lunch and a glam bag. each regisration package is different. 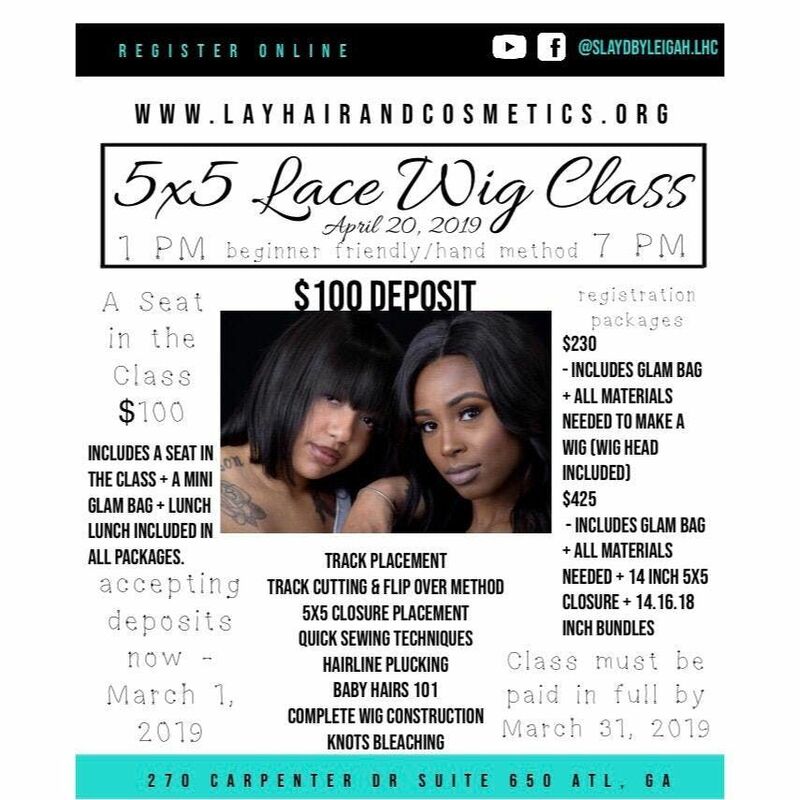 A Seat in the class- $100 - includes a mini glam bag, lunch, and a seat in the class. Build a Wig Package - $230 - includes all of the above + all material needed to make your own wig. mannequin head included. Full Package - $425 - includes all of the above + 14, 16, 18 inch bundles + 14 inch 5x5 lace closure. this is a look 'n learn unless you choose the FULL PACKAGE. You may also purchase bundles through LH&C if you would like to follow along making your own wig using longer or shorter bundles. BUNDLES must come from LH&C if you don't get the Full Package in order for you to physically follow along during the class. you are able to take notes. note pads and pens will be provided. Deposit of $100 closes March 1, 2019. The rest of payment and full payments must be made NO LATER THAN March 31, 2019. Deposit is non-refundable. Rest of payment for class will be sent out via invoice March 1, 2019 for you to pay at your convenience (by the due date).